This is for everyone with a love/hate relationship with the "dreadmill," otherwise known as the treadmill. Sure, we love the healthy benefits it bestows upon our bodies, but the monotony of jogging mile after mile on the boring machine can easily get the best you. Luckily, there are other (maybe even better!) ways to get your cardio fix without chaining yourself to a treadmill. If you're feeling like you're in a workout rut, don't sweat it; just switch up your routine a little and reap a lot of results with some of our favorite fast-paced, fun moves you can complete anywhere. Give the treadmill a rest and instead revamp your routine with these heart-pumping moves that'll make you forget all about the gym! Start in a high plank with your shoulders over your wrists with your hips in line with your body. Jack the feet out to the edge of your mat without moving the upper body or hips. Jack the feet back together, then jump feet to the outside of your hands while your hands remain planted on the floor; repeat. Start with your feet hip-width apart and extend one behind you as the front leg bends. Simultaneously extend your arms out and above your head. Quickly pull the back leg through to the front and bring your hands down, tucking elbows into your sides powerfully as you feel your abs contract; repeat. From standing, cross one leg in front of you and drop into a lunge. Reach your opposite hand all the way down to the floor while letting your chest drop. Next jump up, swinging your arms overhead and making a big circle with your arms; you should get both feet off the floor at the same time. Switch your feet, leaping from side to side. Cross the opposite leg in front of your body, lunge and touch the floor. Repeat. Step your feet out wider than your shoulders and turn them out 45 degrees. The hips will rise up and down, not back and down like a normal squat; keep your chest lifted. Power out of the bottom of your squat and jump; make sure your knees are bent when you hit the ground again. Repeat. Place one foot in the center of the BOSU ball and bend the knee, putting your weight onto this foot. Let the other foot step out to the side and keep your chest lifted. Press of the BOSU and switch feet; the switch happens quickly while moving side to side every second or faster. Turn your body at a 45 degree angle with your feet close together and knees bent. Get your hands up like you’re holding a basketball; keep the elbows up and look up, too. Jump up straight and raise the arms like you’re shooting a ball overheard; land with soft knees and step and turn to face the other side to repeat. 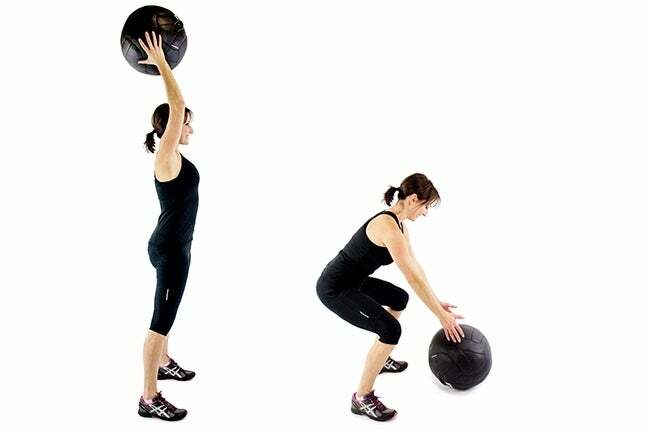 Place one foot in the center of the BOSU and drop into a lunge. Make sure both knees are bent at a 90 degree angle and the chest is lifted. Bring the back foot to the side in a wide stance, then drop into a squat by letting the hips fall back and down; keep the chest up. Push of the outside foot and pull the knee up to hip height. At the same time, jump up and raise your arm overhead to power up the jump. Land with soft knees, then step back into your lunge to being the next rep.